Sermon for Reformation Sunday: "The Word Abides"
We’ve probably all walked in on our family, friends, or coworkers having an argument. It feels like you’re at Wimbledon. Words flying back and forth faster than Roger Federer’s serve. Tension increasing with each volley. Emotions bursting with forehand-like power. In John 8:31-36, we walk into the middle of an argument that’s been intensifying since Jesus began his public ministry; here in chapters 7 and 8 of John’s gospel it explodes. The Jews pepper Jesus with questions: Who are you? What signs do you do? Who is your father? And Jesus answers them repeatedly. I AM the Bread of Life. I AM the Light of the World. Before Abraham was, I AM. This is more than an argument among friends. It is a war of words. A battle between faith that clings to the words of Jesus, and faith that clings to the flesh, to the family tree of Abraham. If you abide in my word you are truly my disciples, and you will know the truth, and the truth will set you free. Centuries later, the conflict continued in the town of Wittenberg, Germany, and in the heart, mind, and pen of a priest and professor named Martin Luther. In many ways, the Lutheran Reformation was a war of words as well. A battle over the question, “How is one saved?” Free forgiveness in the name of Jesus or forgiveness bought and sold in the name of the pope. Luther found the answers to his questions in the same place Jesus pointed the Jews in John 8. Not in the works of the flesh, not in the family tree of Abraham, but in the faith of Abraham. In the Word that declares us righteous. In the Word that proclaims God justifies the ungodly and dwells with and for sinners. In God’s Word that creates faith. If you abide in my word you are truly my disciples, and you will know the truth, and the truth will set you free. Now 501 years after Luther posted those 95 Theses on the church door in Wittenberg, we find ourselves on the same battlefield surrounded and outnumbered by our enemies. The devil’s lies and temptations. The fallen world’s false hopes and fleeting comforts. Our own doubting, despairing, desiring sinful flesh. Like the Jews in John, we are salves of sin. Even on Reformation Sunday, it’s tempting boast in ourselves: “We’re descendants of Luther and no one is as righteous as we.” If we say we have no sin we deceive ourselves, and the truth is not in us. It is for us, as it was in Luther’s day, and in Jesus’ day…a war of words. A war that, if left to ourselves, would be lost. But where our words fail us, Jesus’ Word frees, forgives, and saves us. For us fights the Valiant One, we sing. Jesus abides with us in our sin to save us. Everything in this fight hinges on that word: abide. It’s an important word in John’s Gospel. It means to live, dwell, or lodge; to stay, remain, and continue. The Spirit abided on Jesus at his baptism (1:32-33). Jesus’ word is abidingin those who believe (5:38). Jesus says those who eat and drink his body and blood abidein him (6:56). Jesus declares that the Spirit of truth abides in us (14:17) and bears much fruit through us (15:4-16). Jesus says we abide in him as a branch abides in the vine and draws life from it. Cut off from the branch we’re fruitless and dead. Where Jesus abides with us we’re fruitful and alive. We don’t find God by looking up into heaven, Luther once said, but by looking down to where Jesus abides with us and for us. In the manger. On the cross. In humble water, words, bread, and wine. Jesus abides with us in the water and word of Baptism declaring us sons and heirs in his house. Jesus abides with us in his promise of absolution: you’re forgiven and set free by the blood of Jesus. Jesus abides with us in his body and blood which abides in the bread and wine for our forgiveness. Jesus abides with us in that simple, yet saving Word that Luther rediscovered…Jesus became the slave to set us free. Jesus let all our pride, despair, doubt, pain, sin, and death abide with him on the cross, so that we would abide with him forever. All have sinned and fall short of the glory of God, and are justified by his grace as a gift, through the redemption that is in Christ Jesus. The war of words ended with Jesus’ final words on the cross: “It is finished.” Jesus’ death and resurrection were the final blow, a grand slam to our opponents of sin, death, and Satan. Game. Set. Match. Sin is forgiven. Death is dead. The devil is defeated. You are free. Jesus abides with you. And you abide in Jesus. Sermon for Pentecost 22: "Through the Eye of the Needle"
I don’t know about you, but I have a hard enough time putting that little thread through the eye of a needle, even on a good day. It’s a lot harder for a camel to go through the eye of a needle. But it’s easier for a camel to go through the eye of a needle than it is for a rich person to enter the kingdom of God. And it’s even hard still – without the stumbling block of our stuff – for anyone to enter the kingdom of God. “Children, how difficult it is to enter the kingdom of God” Jesus declares. It seems like Jesus is telling us that getting into the kingdom of God is more than difficult. It’s impossible. That it’s going to take a miracle. That’s exactly Jesus’ point. It takes a miracle to get a rich man into the kingdom of God. It takes a miracle to get anyone into the kingdom of God. It takes a miracle to get you and me into the kingdom of God. And if all that sounds a bit strange to our ears, we’re not alone. Jesus looked around and said to His disciples, “How hard it is for those who have riches to enter the kingdom of God!” And the disciples were astonished at His words. Remember the rich man in last Sunday’s Gospel reading? “What must I do to inherit eternal life”, he asked Jesus. After a short catechism review of the second table of the Law - all the commandments pointing us to our neighbor – Jesus fired a first table of the Law homing missile right at the rich man’s heart. “Go and sell all you have and give to the poor.” And he went away sorrowful, for he had great possessions. The disciples were astonished. If anyone is blessed by God, it’s this guy. The disciples were measuring God’s grace by the gold standard. The greater your wealth was, the more favorably God looked upon you. The more stuff you had the more God must love you. Indeed, with man it is impossible. We cannot save ourselves. Our wealth and possessions won’t save us. Our portfolios and bank accounts won’t save us. The Beatles were right: money can’t buy us love. With man, the stuff we own quickly owns us. With man, we focus on the gift and ignore the Giver of all things. With man, it is impossible. The rich man’s problem. The disciples’ problem. Our problem. It’s all the same. Whether we have a lot of earthly stuff or a little, we all have the same problem. The wages of sin is Death. With man it is impossible. The real miracle isn’t that we would sell our stuff; it’s God’s gift of faith. That’s the real miracle. Faith in Jesus Crucified. For I believe that I cannot by my own reason or strength believe in Jesus Christ, my Lord, or come to Him. It takes a miracle to get us into the kingdom of God. It took Jesus becoming man for us. It took Jesus becoming our sin for us on the cross. It took God Himself dying on the cross to drag us through the needle’s eye into the kingdom of God. In God’s kingdom, his grace and favor isn’t measured by who has the most possessions, but in Christ who though he was rich yet for our sakes became poor, so that we, by his poverty might be made rich. In God’s Kingdom there is only one transaction that saves us: Jesus who knew no sin became sin for us. In God’s Kingdom, the true and only Rich Man joined us in our weakness and lostness to thread us through the narrow door of the cross. Jesus became the man of sorrows for us. Jesus took the last place on the cross to give us the first place at His table. With man it is impossible, but not with God. For all things are possible with God. Indeed, believing any of this is impossible for us. But not for God. He does the impossible. He gives us faith. He works the miracle. The very same miracle the Holy Spirit worked in you on the day of your Baptism, and every day since. The Holy Spirit continues to work this miracle of faith in us as he calls us by the Gospel, enlightens us with his gifts, sanctifies and keeps us in the true faith. That’s all well and good we say. Eternal life is covered. Faith is a gift. I’m forgiven. But what about now? Today? We left everything and followed you,” Peter said. Truly I say to you, there is no one who has left house or brothers or sisters or mother or father or children or lands, for my sake and for the gospel, who will not receive a hundredfold now in this time – houses, brothers and sisters and mothers and children and lands – with persecutions, and in the age to come eternal life. Really? A hundred times more than what we have now? That sounds just as impossible to believe as a camel going trotting through the eye of a needle. And yet, it’s true. Believe it. Today. Whether you live in a one-bedroom apartment or a large home with plenty of land, you have 100 times more than the rich man who thinks this is all there is. Knowing that all we have is a gift from God gives us infinitely more than the Bill Gates, Steve Jobs, or Paul Allens of the world. Knowing that all we have – our daily bread and possessions – are blessings from God, gifts that flow from Jesus’ death on the cross, makes all our earthly things worth more than all the billionaires combined. As Solomon writes, whatever wealth and earthly possessions we have are gifts from God. Gifts to enjoy and gifts to use in love for others. On our own, that’s impossible to believe. But not with God. All things are possible with God. God’s free gift of salvation for you. God’s countless gifts of daily bread given to you. God specializes in making the impossible possible for us in Jesus crucified. He does it every Sunday. Every Baptism. Every absolution we hear. Every “I forgive you” that’s announced. Every crumb of bread and drop of wine that gives us Jesus’ body and blood for our forgiveness, God is doing the impossible for you. With man it is impossible, but not with God. For all things are possible with God. Sermon for Pentecost 21: "The Greatest Possession"
We’ve all had that frantic feeling. Searching. Turning couch cushions upside down. Tossing papers like confetti. Crawling around on our hands and knees. And finally, there it is. Right in front of us the whole time. How did I ever miss it? That’s where we find this rich young man in today’s Gospel reading. He was missing something too. Only you wouldn’t think it from looking at him. He had the trifecta. Everything society tells us we need to be happy. Health. Wealth. Power. He had it all. Kind of an odd question if you think about it. After all, Inheritance is pure gift. Someone dies and names you as an heir. Not by doing but by receiving. Not by works but by grace. And yet, that’s precisely the default religious setting of our sinful flesh. We love checklists, dos, and don’ts. Scorekeeping, accounting, measuring, and comparing with others. What must I do, think, decide, say, or feel to inherit eternal life? This do-it-yourself religion is at the heart of every world religion, except Christianity. Christianity is the opposite. God’s grace is received, not achieved. It’s given, not earned. Gift. Grace. Christianity is outrageous forgiveness for undeserving sinners. Yes, this young man had it all. But none of it was enough to satisfy that nagging feeling that something was missing in his life. In response, Jesus gives him a quick catechism review. You know the commandments: Do not murder. Do not commit adultery. Do not steal. Do not bear false witness. Do not defraud. Honor your father and mother. Teacher, all these I have kept since my youth. And how does Jesus answer that? I know how I would’ve responded. Huh, yeah right. Kept the commandments? Sorry, Wrong answer. Try again. There’s no way you’ve done any of those things, let alone perfectly. That’s what God’s Law does. It accuses us. Kills us. No matter how much we’ve done, it’s never enough. Jesus doesn’t love him because he kept the commandments. Jesus’ love isn’t a transaction. Jesus’ love is a gift. God shows his love for us in this, that while we were still self-centered, scorekeeping sinners, Christ died for us. So, Jesus spoke in love to kill the gods of riches and religion that he clung so dearly to give him the one thing he was truly lacking: Jesus. Jesus does the same thing for us. He loves us enough to show us our sin. What is it that gets in our way of following him? Who or what is that we fear, love, and trust in above all things? Who or what do we look to for our daily bread? If our treasure is where our hearts are, what treasure do we uncover? Jesus says that out of our hearts come evil thoughts – murder, adultery, sexual immorality, theft, false witness, slander. As St. Augustine once wrote, “Our hearts are restless, O Lord, until we find our rest in Thee.” The ways we try and calm our restlessness and fill that emptiness left by sin are endless. And yet, as great as our selfishness, sin, and love for ourselves is, Christ’s selfless, perfect love for us is far greater. Jesus calls and gathers us to his church like a rummage sale. “Here, he says, you can bring all your junk and sin. Dump off all that clutters your heart and mind. Leave it here with me, for I am gentle and lowly in heart and here you will find rest for your souls. That’s what it means to follow Jesus. Not that we keep a perfect checklist of all the commandments we’ve kept – after all, that’s a game we lose every time, just ask the rich young man. No. Following Jesus means daily dying and rising die with Jesus; to lose our life of self-righteous pride and find true righteousness in Jesus’ blood; to become last in order to be first; to be poor in spirit yet inherit the kingdom of heaven. This is what it means to live in our Baptism. Daily we hear those words: “follow me.” It’s not a to-do list; it’s Jesus leading us to his Word. Jesus leading us to pardon and peace in absolution. Jesus leading us to eat and drink his body and blood. Jesus leading us to our friends and neighbors with his love and mercy. The young man was so worried about losing his possessions that he missed the answer to his question. What must I do to inherit eternal life? “Follow me.” Follow Jesus. Here was the answer the young man was searching for. Jesus who gave up everything to be our King, Savior, and Redeemer. Jesus, who thought he was rich for our sakes became poor so that by his poverty we might be made rich. Jesus who declares us to be his greatest possession through his birth, death, resurrection, and ascension for us. For that is what the Kingdom of God is: inheritance. Gift. The currency of the Kingdom of God cannot be purchased by gold or silver, by status or wealth, by poverty or piety, but by the holy precious blood and the innocent suffering and death of Jesus. All for you. So, what happened to that rich young man? He went away sorrowful, Mark says, for he had great possessions. But what happened next? Did he go home look around at all his stuff and say, “He’s right, it’s all rubbish. It just gets in the way.” Maybe he packed it all up, dropped it off at Goodwill, and ran to follow Jesus on the road. We just don’t know. Mark is a good storyteller that way. We’re not told the end because he wants us to read ourselves into the story. Will we leave sorrowful? Or will e see that what we seek is right in front of us: Jesus speaking to us in his Word. Jesus forgiving our sin with a word. Jesus baptizing us in his death and resurrection. Jesus feeding us with life and salvation. Whatever it is that we lack; whatever it is that we need, whatever peace and comfort we seek – we find it in Christ Crucified for us. Sermon for Pentecost 20: "What God Joins Together"
One of the many ways a pitcher tries to get a batter to strike out is by throwing a few consistent, seemingly hittable pitches in a row. Fastball inside. Fastball outside. Fastball down the middle. And then…the change up, a slider, or a curve ball. Today’s Gospel reading leaves us feeling a bit like a batter in the box. The last several weeks have been like a fastball down the center of the plate: Jesus healing the deaf-mute man. Jesus casting out demons. Jesus sending his holy angels to protect us. And then Jesus throws us a curve ball. Let’s be honest, this is one of those times when Jesus’ words make us uncomfortable. We pray and wrestle with these words. We squirm and sweat like a batter down in the count. It’s true, today’s Gospel reading is challenging. And not because Jesus’ words are difficult to understand. No. That’s the problem. Jesus speaks all too clearly. It’s like he’s intentionally hurling a fastball right at us. His words on marriage and divorce hit close to home. Every one of us know someone whose life has been affected by divorce. So, what do we do with Jesus’ words? Do we explain them away or throw them out because they’re hard? But if we do that, where do we stop? Maybe we ignore it; make like King Arthur in Monty Python’s Holy Grail and run away! ; preach on a different Scripture reading. Believe me, that thought crossed my mind several times this week. But ignoring God’s Word is just as bad as throwing it out. Truth is, this text brings us all to our knees. If Jesus is specific about sin in marriage, he’ll be just as specific about all our sins. Jesus’ words expose the pain, guilt, shame, and sin that affects everything and everyone in our life, even God’s gift of marriage. In Genesis 2, we see God’s gift of marriage before the fall of sin. A perfect, holy union. Adam and Eve are naked and not ashamed. Here in Mark 10, we how sin affects God’s gift of marriage. The Pharisees came to Jesus with a question to test him. So we know right away it wasn’t an honest question. “Is it lawful for a man to divorce his wife?”It’s a trap. The Pharisees try and draw Jesus into a popular debate among the rabbis of the day. One school was extremely strict on divorce law, the other was quite lenient. The Pharisees hoped that whichever side Jesus chose, the opposition would reject him. And yet every time the Pharisees lay a trap for Jesus, he turns it around. What did Moses command you?Jesus replies. “Moses allowed a man to write a certificate of divorce and to send her away” they say. Because of your hardness of heart Moses allowed it. Not a command, but a concession for life in a messy, fallen world where everything, every relationship, and every one of us is broken by sin. After Genesis 3, divorcemay be tragically needful, it may be inevitable; it may not be possible even for two baptized children of God to put marital Humpty Dumpty back together again. This is God’s will, his plan. One man. One woman. Makes one flesh, a marriage. And whenever this breaks down it’s a terrible, heart-wrenching thing. So what does that mean for Christians, for our family members, and our good friends who have gone through a divorce? How do we share Christ’s love in our families and marriages, flawed and sinful though we all are? We won’t find answers in the Law. The Law kills us. Accuses us. Reveals that whether we’re married or single, we’ve all sinned and fallen short of the glory of God. The Law won’t save struggling relationships, heal broken homes, or take away our pain and sin. Our marriages and relationships may not save us, but there is a marriage that does save. There is a one flesh union that cannot be destroyed. The perfect marriage of Christ and the Church. In this holy union, Jesus is our heavenly Bridegroom; we are his beloved, baptized, holy Bride. He unites Himself to us by water, Word, and the Spirit. 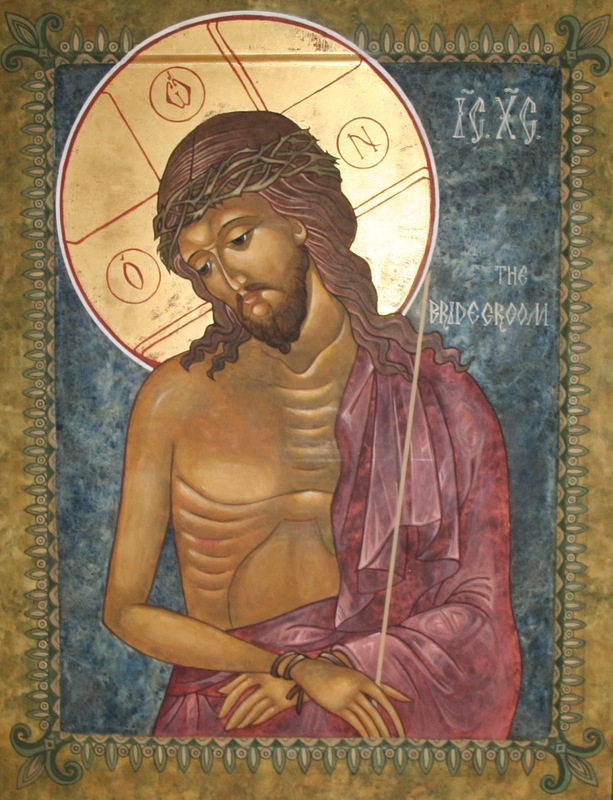 He joins us in our humanity as our Bridegroom and Brother. He gathers us together in a holy communion, as we receive His Body and Blood. 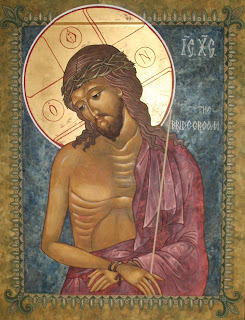 Jesus our Bridegroom is bone of our bone, flesh of our flesh. And if Eve was taken out of Adam’s side and given new life, how much more are we, Jesus’ beloved Bride, taken from the side of Jesus who was pierced for us on the cross. Strangely as it may sound, one of the most common words for forgiveness in the NT is the word divorce. On the cross, Jesus divorced us from our sin. He took it away. Forever. For you. That’s where Jesus took every single one of our adulteries, iniquities, and idolatries and covered them with his holy, precious blood and his innocent suffering and death. Jesus who shares our humanity shared in our sin, every messy, broken, ugly bit of it. Jesus was nailed to the cross as the adulterer. Thief. Murderer. Liar. Sinner. He made our sin his own. He made a solemn vow to take you as His beloved bride, to make us holy, pure and spotless; to have and to hold us for all eternity. This is how we approach Jesus’ difficult words. Through Jesus’ cross. If there’s any hope for us in our relationships, it’s found in living each day in Jesus’ forgiveness, given freely to us. It’s by God’s grace alone that any of our relationships work the way God intends and wills. Our care for one another in our marriages, families, and friendships flows from the forgiveness won for us in Jesus. We love because he first loved us. Our hope and certainty isn’t found in Moses, in legal loopholes, or in the Law. But in Christ crucified and His marriage to His Church and here, in the marriage supper of the Lamb. Sermon for St. Michael and All Angels: "God's Messengers"
Our daily life is full of messages. Phone calls, texts, emails, a card in the mail, carrier pigeons…ok maybe not pigeons. Whatever the means, behind every message is a messenger. Text messages rely on circuits, chips, and signals so we can text our friend sitting next to us. Thank you cards delivered by the mailman. Amazon packages don’t just magically appear on our doorstep. Where there’s a message, there’s a messenger. And that’s what, or rather who, we rejoice with, remember, and give thanks to God for today. His ministering spirits. His messengers. His holy angels. The Feast of St. Michael and All Angels reminds us that we live in a world that is bigger than we are. Creation is more than meets the eye. God is Maker of all things visible and invisible, as we confess in the Creed. God’s angels are his servants; they dwell in eternal light, incorporeal, spiritual beings, yet creaturely, easily moving between heaven and earth. Though there are an innumerable myriad of angels, Scripture only names two - Michael the warrior, the protector of Israel, and Gabriel the herald, the preacher of the Incarnation. There’s the mysterious seraphim, six-winged fire angels who flutter around the throne of God singing an eternal “Holy, holy, holy” to Father, Son, and Holy Spirit. And there’s the cherubim and the countless throngs of heavenly creatures mysterious beyond comprehension, yet united with us in worship. Scripture also teaches us that God’s holy angels aren’t the cute, cuddly little cherubs of Hallmark Christmas cards. There’s a reason the first words they speak are, “Fear not!” They’re God’s Spiritual Warriors. The real Guardians of the Galaxy for God’s baptized children. This is good news for us. We need his guardian angels. For God’s holy angels aren’t the only angels that exist. There are fallen angels too. They rebelled against God, and their warfare against us is ceaseless, like the sirens beckoning Ulysses to join their sedition. It’s not a war of flesh and blood, Paul says. Satan’s weapon is his word. He deceives. He accuses. He leads astray. We know this. We fall into his deception. We’re prideful and lust after power as he did. And the worst part about his accusations against us is that it’s all true. We are guilty of all the sins against God that Satan throws in our face. And yet, this is where the devil deceives even himself. His greatest lie is exposed. For our sins no longer belong to us. Jesus has taken them away. Every accusation and temptation – answered for and overcome by Christ’s death for us. Every sinful thought, word, and deed, all that we’ve done and left undone – placed it into his pierced hands, under his feet that crushed the devil, and upon his head crowned with thorns for us. Jesus received the guilty verdict we deserved. Jesus fought for us on the cross and won. By his dying he has destroyed death. Conquered Satan. And by His resurrection he has broken the power of the grave. Satan’s accusations are now as empty as Jesus’ tomb. Now war arose in heaven, Michael and his angels fighting against the dragon. And the dragon and his angels fought back, but he was defeated, and there was no longer any place for them in heaven. And the great dragon was thrown down, that ancient serpent, who is called the devil and Satan, the deceiver of the whole world—he was thrown down to the earth, and his angels were thrown down with him. And I heard a loud voice in heaven, saying, “Now the salvation and the power and the kingdom of our God and the authority of his Christ have come, for the accuser of our brother has been thrown down, who accuses them day and night before our God. In Jesus Crucified, the war is over. “I saw Satan fall like lightning,”Jesus says. Sin, death, and the devil are thrown down. Defeated. Overcome. Conquered. Not by the strength of Michael and his angels. Not by our strength, will power, or resistance to temptation. But by the blood of the Lamb, who shed His blood on the Cross for you. Satan’s accusations against us are null and void. For the Blood of Jesus – given us in Baptism and the Supper - cleanses us from all sin. Jesus’ victory is yours. His death and life are yours. This is the message of God’s holy messengers: Christ crucified for you. They do not desire our worship. As Jesus says, their faces are ever turned toward God. That’s where they point us as well: to the Word made flesh for us. To Jesus the crucified and risen Son of God who though equal to the Father was made a little lower than the angels in order to rescue us by His death, whom the angels now adore with unending worship praise. Mysterious though they are, we know what’s most important about God’s holy angels. They’re his heavenly heralds of Good News. Bless the Lord, O you his angels, you mighty ones who do his word, obeying the voice of his word. That’s their job: messengers of God’s Word. Today our Lord arms us with the same weapon he issues to his heavenly army of angels, His holy Word. The Word that fills our ears, eyes, hearts, minds, and mouths with Jesus forgiveness. Today Jesus calls us to be fellow messengers with the 72 disciples and his holy angels; he sends us out into our daily vocations in life as he did the angels to the shepherds, to share the Good News of “Christ Crucified for you”, to the least, the lonely, and the lost. Today we thank and praise our Lord for his messengers, and all the more for his message of Good News, that sin, death, and the devil are conquered by the blood of the Lamb and our names are written in heaven, where the angels seek his continually face and sing his praise. 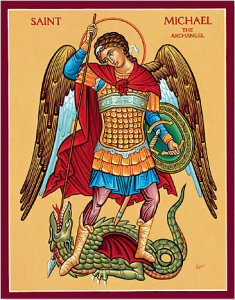 On this day of St. Michael and All Angels, as we do every Sunday, we worship with angels and archangels and all the company of heaven, praising our Lord who gathers heaven and earth for the marriage supper of the Lamb who was slain, yet lives for you and sends his angels to guard you in all your ways.